At Westminster Antique Mall - browse booths featuring everything from teacups to military collectibles. A Real Find Antiques in Finksburg has a vast furniture collection along with refinishing and upholstery services. At Then…& Again Antiques in Annapolis, dealers sell sports memorabilia, vinyl records and antique weaponry, while the Antique Center at Historic Savage Mill fits in perfectly at the restored 19th-century cotton mill. In Western Maryland, visit Valley Antiques & Uniques in Funkstown, or Englander’s Antiques in Oakland, where you can grab a milkshake at the shop’s original soda fountain. Just outside of Washington, D.C., multi-dealer markets share sidewalk space with galleries and restaurants at Kensington’s Antique Row. Dozens of shops stocked with furniture, jewelry, quilts and porcelain earn New Market the title “Antiques Capital of Maryland.” In funky Frederick, find 200 dealers in an eight-block radius that’s even pet friendly. Just across the Chesapeake Bay Bridge on the way to the beach are big savings on Under Armour and more at the Queenstown Premium Outlets. In Western Maryland, visit the Hagerstown Premium Outlets. Or check out the area around Perryville, where you can hit Hollywood Casino after a day of shopping in the region. 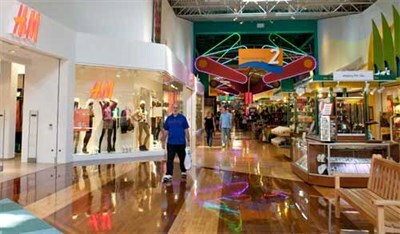 Arundel Mills has the same great set-up—a mall plus numerous entertainment options, including Live! Casino and Hotel right next door. Head to National Harbor, home to Tanger Outlets and more than 150 boutiques for mom and dad, plus Build-A-Bear Workshop and Peeps & Company for the kids. For a one-of-a-kind getaway, book a trip to one of Maryland’s Main Street districts. Enjoy shopping with a side of history in Mount Airy, or see firsthand how Cumberland’s railroad roots have given way to an arts focus in the town’s open-air Town Centre. Spend a day exploring Leonardtown’s Fenwick Street. The picturesque waterfront town of Havre de Grace has antiques, gifts stores, and legendary carved waterfowl decoys. On the Eastern Shore, see why Berlin was named “America’s Coolest Small Town.” Or pair a day of shopping in artsy Cambridge with a tasting of some great local wines. Start your Baltimore excursion at chic Harbor East. With hot shops like J. Crew, Anthropologie, Warby Parker, Free People and the Under Armour Brand House, it’s the perfect spot to begin your urban shopping adventure. Find unique boutiques in hip Hampden, Mount Vernon, Federal Hill and Canton, all within a few miles of the harbor. Hampden’s unique Ma Petite Shoe combines elegant footwear and exquisite chocolates under one roof, and Atomic Books is home to “Literary Finds for Mutated Minds.” Looking for a classic, cosmopolitan gift? Historic Mount Vernon showcases art, rugs, furniture and attire from around the globe. The fashion-forward flock to PUNCH! in “Fed” Hill, and parents will love walking through Shofer's Furniture, spread out over 70,000 square feet on five floors. In Canton, find mainstream shopping at The Shops at Canton Crossing, or stroll “the Square” of O’Donnell Street to peruse independent boutiques like 2910 on the Square, named “Best Late Night Shopping” by Baltimore Magazine. Whether you’re just window shopping or ready to drop some serious cash on haute couture, Maryland has you covered. 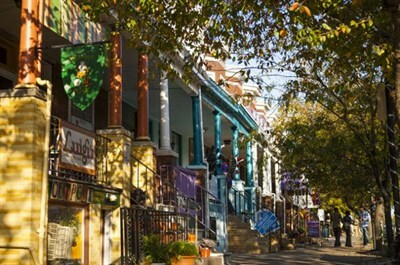 In the D.C. suburbs, the highly walkable Bethesda business district is home to Bethesda Row and Wildwood Shopping Center, where shoppers will find apparel and accessory boutiques plus home furnishings, décor and unique gifts. Visit Silver Spring, and stop in Ellsworth Place to shop, then hop aboard VanGo—a free shuttle service that runs Monday through Saturday—to rest your feet for more shopping. Feel like you’re shopping Fifth Avenue when you patronize the high-end shops of Chevy Chase, including uber-chic designer Felix Alonso’s Vogue by Alonso. More excellent shopping can be found throughout Central Maryland. The Village of Cross Keys in northern Baltimore is a destination for denim, formalwear and gowns. In Towson, explore the luxury wing at Towson Town Center and nearby bridal shops and formalwear boutiques including Gamberdella and M’Jourdelle & Associates. South of Baltimore in Howard County, find high-end labels at Liquid Blue Denim or Hyatt and Co. in Maple Lawn. Savage Mill houses specialty shops, including Cherie Amour bridal shop and African-inspired O’Mak Designs. Parents can enjoy upscale shopping at The Mall in Columbia, while the kids will love the mall’s grand merry-go-round.